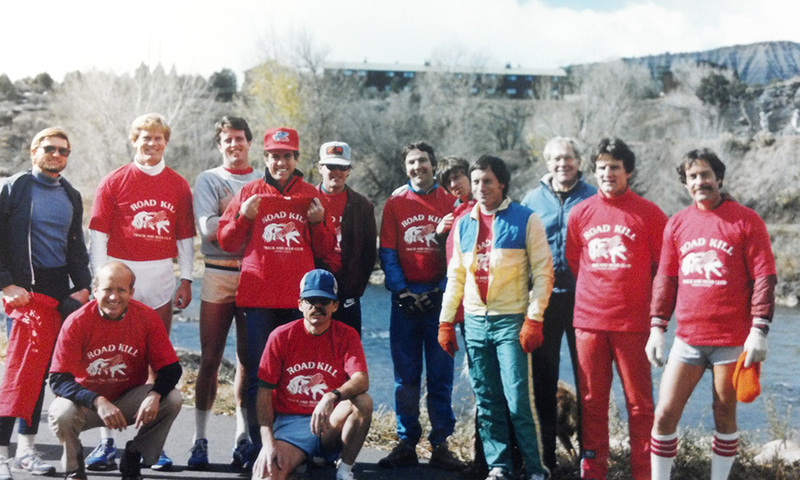 The Durango Running Club has existed in some form for nearly 40 years. The club’s earliest members recall its formation in the late 1970s during the Frank Shorter era when running gained mainstream popularity nationwide. The club has served the running community of Durango and southwest Colorado ever since. Members of “Durango Motorless Transit” met for weekly Monday evening group runs at what was once the Purgatory Sports Shop on south Main Ave in downtown Durango. A crew of regulars kept building the club’s momentum. Eventually, other group runs and activities were added, including the Narrow Gauge 10 Mile Run, first held in 1978, which remains one of the oldest continuous running events in Colorado (predating the Bolder Boulder by a year) and a true Durango Memorial Day tradition. Other events followed, including the Diet Pepsi 10K, as well as the Animas Valley Half Marathon, now known as the ever-popular Steamworks Half Marathon. The Road Kill crew, one of the club’s weekly running groups, in 1987. From Left: John Wolgamott, Jim Morehart, David Rice, Buck Arnold, Mike Elliott, Jesse Colbert, Grant Glover, John Lawson, Art Rohr, Dave West, Larry Malick, Dave Rakita and Tom Burnett. In the early 1990s, DMT’s participation dwindled until a young, motivated Marc Witkes took the helm as club president. His enthusiasm inspired a new crop of runners and pumped life back into the club, which saw its membership increase once more. With plenty of help from others, Marc reinstated weekly runs in the form of the Thursday Night Trail Run, which provided a welcoming environment for runners of all abilities. Sadly, Marc passed away unexpectedly at the 2006 Tucson Marathon. The Marc Witkes Memorial Fund was established in his honor. Into the new millennium DMT grew, thanks in large part to the countless board members, organizers, volunteers and club members who poured their energy into the club and supported its events. In the 2000s, the club added track workouts and Saturday long runs to the weekly lineup, and races like the Kennebec Mountain Run, Animas Mug Run and the Turkey Trot.